Featured image: The file photo shows members of the White Helmets volunteer organization walking amid rubble in Syria. Western countries have reportedly been scrambling to evacuate “volunteer” White Helmets from Syria, who have been accused of cooperating with Takfiri terrorists and staging false flag gas attacks. CBS News broadcasting service reported on Saturday that White Helmets members are in danger of assassination and in need of rescue as the Syrian army intensifies its counter-terrorism operation in the country’s southern part. The report said the issue of the White helmets’ withdrawal from Syria had been raised with US President Donald Trump in multiple conversations with allied countries on the sidelines of the July 11-12 NATO summit in Brussels. 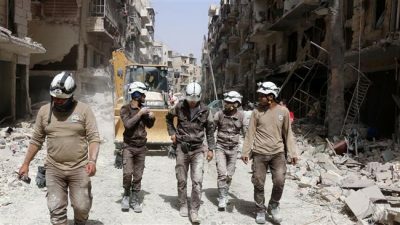 The Netherlands, Britain, France, Canada and Germany have been trying to find a way to get an estimated 1,000 White Helmets volunteers and their family members out of Syria, the report added. British Prime Minister Theresa May brought up the issue during her meeting with Trump in the UK, and that the topic may also be discussed at Trump’s upcoming summit with Russian President Vladimir Putin. The White Helmets was founded in Turkey in 2013 by former British MI5 officer James Le Mesurier. Since its establishment, the group has received at least $55 million from the British Foreign Office, $23 million or more from the US Office of Transition Initiatives and untold millions from Qatar. US officials and Western diplomats say the evacuation has not been formalized on the agenda of the July 16 Trump-Putin meeting due to uncertainty about the Russians’ help in the process, The CBS News said. A US government official stressed that efforts to evacuate the White Helmets from Syria are in line with the Trump administration’s plans for a withdrawal from the Arab country. Back in March, Trump ordered the State Department to suspend $200 million in recovery funds for Syria, including aid to the White Helmets, amid a review of the future of the US role in the war-torn country. Three months later, however, Trump authorized the release of $6.6 million in previously frozen funding for a volunteer organization, without referring to the $193.4 million that remains frozen. 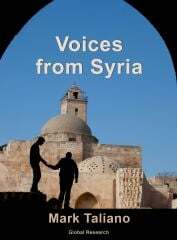 Both Damascus and Moscow have accused the volunteer group of having staged the suspected chemical weapons attack in the town of Douma in Syria’s Eastern Ghouta region on April 7. Syrian President Bashar al-Assad described the White Helmets as “a branch of al-Qaeda and al-Nusra” militant groups and a “PR stunt” by the US, the UK and France. Russian Foreign Ministry spokeswoman Maria Zakharova said the group claims to be a humanitarian NGO, but actually supports terrorists and covers up their crimes. “The White Helmets not only feel at home on Jabhat al-Nusra and Daesh-controlled territories but openly sympathize with them and provide them with information and even financial support. How is that for double standards? There is documentary evidence of the White Helmets’ involvement in some of al-Nusra’s operations and cover-up over civilian deaths,” she said.